Most boat owners are aware that the surface of their boat can become faded, discoloured, chalky or even cracked. This is when a repaint or a repair is required. 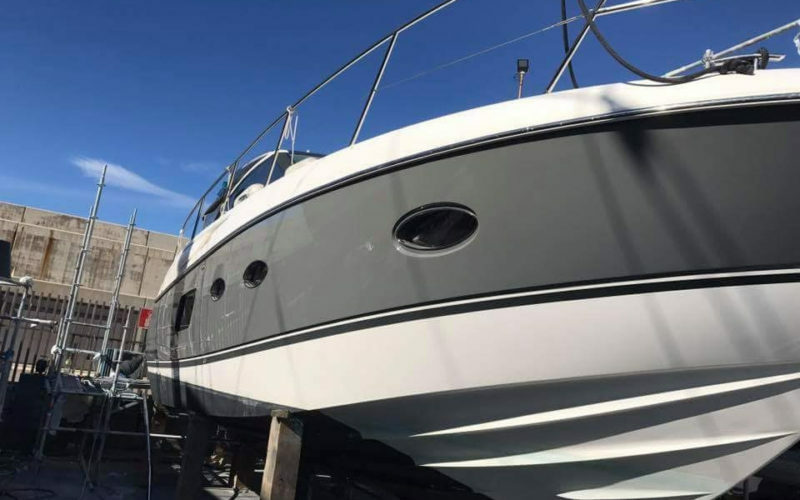 Marine Bodyworkz Ltd has a team of specialists that carry out such tasks to the highest professional standards ensuring a flawless finish every time. A new winter coat can be achieved with our ‘cut & polish’ process that will leave your boat looking brand new once more. To ensure there’s a real ‘wow factor’, we flat and polish all paintwork (other than polyurethane paints). This creates a glossy, smooth mirrored appearance that will really turn heads. Repair specialists – Carrying out local and/or large repairs to your boat to ensure they look like new. Protecting the surrounding area, we repair the damaged/problematic area and postcure. It is then professionally blended in with the original paintwork ensuring the repair is no longer visible. We use only market leading compounds, finesse and waxes leaving your final coat shiny, waterproof and resistant to UV light. Having perfected our techniques and fine tuned our methods over many years, our expertise in this field is second to none. We do not cut corners and have the knowledge along with the equipment to deliver outstanding results each and every time, ensuring longevity of the repair or repaint carried out for years to come. Anytime, anywhere, in any condition…. Having worked all over the world in many different environments over the years. From -30 degrees Celsius in Finland to 84% humidity in Shanghai, we are capable of creating a safe temporary setting to complete any task at hand.